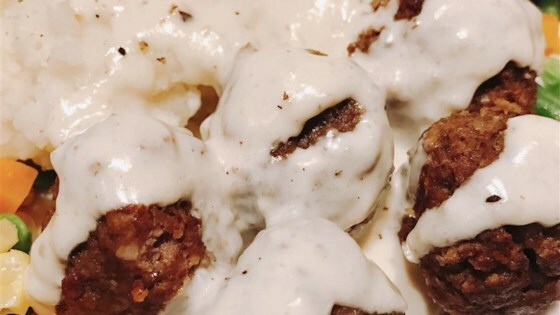 "My family's favorite Finnish meal is these Lihapyorykoita (Finnish Meatballs) with Punajuuret (Beets), and Perunasose (Mashed Potatoes). Serve with cranberry sauce, I personally like a quarter of a pickle on the side." Mix the ground beef, bread crumbs, onion, egg, cream, salt, and allspice in a bowl with your hands until evenly mixed. Roll the mixture into golf ball-sized spheres. Melt the butter in a large skillet over medium heat. Cook about half the meatballs in the melted butter until evenly browned on all sides, 5 to 7 minutes; remove to a plate and repeat with the remaining meatballs, keeping the liquid in the skillet when finished. Sift the flour into the skillet drippings; cook the flour in the skillet drippings until brown, 2 to 3 minutes. Slowly stream the milk into the skillet while whisking vigorously; pour the cream into the mixture and stir until smooth. If you aren't good at making gravy and end up with some lumps you can pour the gravy through a strainer. Return all the meatballs to the skillet; stir to coat with the gravy. Bring the mixture to a simmer and cook until the meatballs are cooked through, 15 to 20 minutes. Wonderful exactly as written. I was a little worried about the lack of seasoning in the sauce, but the drippings from the meatballs flavor it perfectly. I served over egg noodles. Very good as is I would not change a thing! The meatballs came out tender and moist with lots of flavor!